Day + 66 The obstacle course…. I suppose, if you think about it, life is one great obstacle course which needs to be negotiated carefully. There are times when less care and consideration is required and there are times when no matter how hard you try, nothing seems to go your way – Today felt like one of those days for me….we are doing everything we can but the gatekeeper of this unit isn’t ready to let us out! As I said on the previous blog, Orla is responding well to the IV antibiotics and is thus well in herself. Over the weekend, she needed some diuretics to help her pee the excess fluid she had accumulated from the extra fluids she was given on thursday and friday to maintain her blood pressure when the bacterial infection was causing it be low. Her breathing became quite rapid because of the extra fluid, she had a chest X-ray on saturday which revealed some of the fluid had made its way into her lungs and caused them to collapse slightly thus she was breathing quicker to compensate and maintain her oxygen levels. This has now resolved and she had another chest X-ray to check her lungs had cleared which they have. The infectious disease team reviewed Orla today as the sensitivities to which antibiotic will work best to kill the bacteria causing Orla’s infection have come through from the lab. The antibiotic has been changed from two to a new one, not because the others weren’t working but the sensitivities give you info as to which antibiotic will work best. Unfortunately, the bug Orla had in her blood is reasonably robust and therefore a slighlty stronger antibiotic than initially thought is required which needs to be administered twice a day. The initial lab report suggested a different antibiotic that could be given once a day might be able to be used and thus the possibility of hospital in the home, this may no longer be the be the option we thought it was!! Luck was on our side in that the infectious disease doctors decided Orla Hickman’s line doesn’t need to be removed….a massive relief! The greatest obstacle today has been the discovery that the Cytomegalovirus (CMV) has decided to rear its head again and is at high enough levels in Orla’s blood, well it was at least when the sample was taken last week when her fever commenced, to require treatment. It may have been reduced by now, another sample was taken today but we won’t find the result of this out for a few days. So in the meantime, Orla has had to recommence the antiviral medication, Ganciclovir intravenously, if the level comes back as lower, this may be able to changed to oral. The nature of this BMT and the immune suppression that it requires means Orla is at high risk of infection. The nature of a child Orla’s age means everything goes in her mouth, plus the numerous medications results in explosive diarrhoea, poo therefore often gets on things including her Hickman line and even with the greatest of care, keeping bugs away is difficult, contamincation occurs and in turn infection. Dormant virus’ then take the opportunity to reactivate and the analogy a good friend used over the weekend, saying its like playing dominoes is in fact very true!! Importantly, as you can see below, Orla in good spirits, even if Mum feels like she is going slightly round the twist after 11 weeks today!! To antibiotics that is…!! 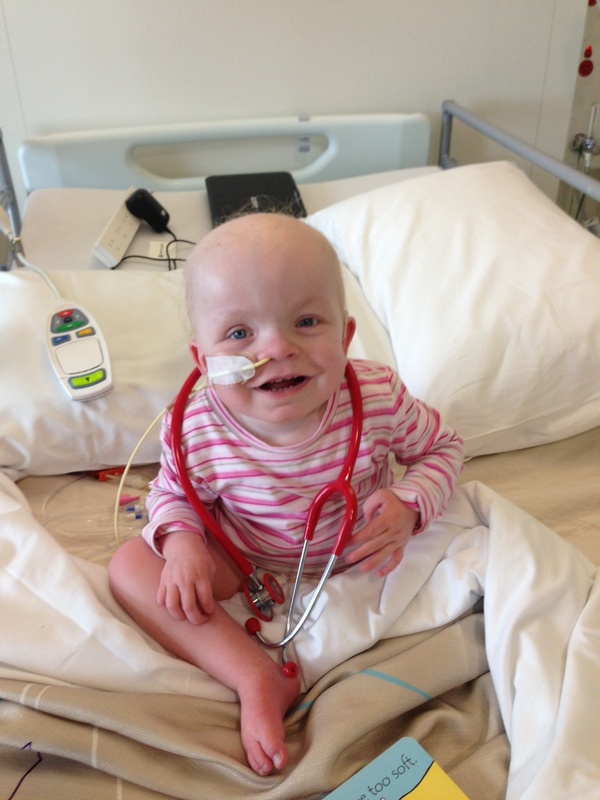 A bacteria found in Orla’s blood is the culprit for the fever this time. We were relieved to find this out yesterday morning hence the possibility of meningitis was ruled out and another lumbar puncture narrowly avoided. Orla’s temperature has now settled, having not spiked since yesterday morning when it peaked at 41.6 degrees which wasn’t pleasant. She is no longer requiring regular paracetamol to keep her temperature under control and her comfortable. Throughout the night on Wednesday and yesterday her blood pressure was quite low, an affect of the particular type bacteria causing her infection and she therefore required quite a bit of extra IV fluid to help it up and she is thus a bit puffy all over now. She also had a blood transfusion today as her haemoglobin, which had been hovering on the lower end of the BMT unit’s threshold, had dropped a little too low. The infection and now the introduction of 2 antibiotics has meant Orla’s bowels are now struggling a little and in turn her nappy rash has now returned and the skin is breaking again a little which is painful for her. She is managing to tolerate the nasogastric feeds at 25mls per hour currently but if this drops any lower, she will require IV nutrition again and will also need to change back to the IV form of the immunosuppression, cyclosporin. So as you have no doubt gathered, there is a bit of a viscious cycle in all of this! There is a possibility the infection may be from Orla’s Hickman’s line and thus there is a chance it will need to be removed and another inserted which to be honest would be even more disappointing than not going home on Wednesday…. So… the question…..how long now ?? The consultant told Ed today that there is a chance the IV antibioticis might be for a couple of weeks and this would then be a minumum assuming her bowel etc didn’t need more time to recover again….There is a chance that we may be able to come home under the care of hospital in the home.. We are definitely in for the weekend and Monday will bring some answers. Day + 61 Another false start…. I quote Ed…” last time we got within 12 hours of going home and today it was 12 minutes.” Orla wasn’t even allocated a nurse for the afternoon shift as the staff were convinced we would be departing….We perhaps should have taken more notice of the family who recently left as their son tried to leave for 6 weeks in a row and every week something stopped them…they have now gone home and we haven’t seen them again!! We are obviously terribly disappointed but have possibly got over it a bit quicker this time….and maybe grateful we didn’t go and have to come back. We have a bottle of champagne here ready for the staff to pass onto the person who physically accompanied Orla’s marrow from overseas to Melbourne and we were tempted to drink it tonight…. waiting for moments to celebrate are perhaps sugar coated!! When the BMT doctor came to see her she was slightly irritable and had another small vomit. She went off to sleep around 11am and when she woke at noon, vomited again and I sensed she wasn’t right although I questioned my instinct as I thought I was possibly anxious about going home. Turns out my instinct was correct. Her temperature at this stage was only mild and when the registrar came to say his goodbyes, as he was on an afternoon off, he joked and told me to be a mum not a nurse!! Orla had a bath etc but remained irritable so at this point it was decided to wait a few hours as her temperature was only 37.6 and thus not high enough to warrant treatment however any doubt is not taken lightly….Ed arrived in and we settled Orla for a nap and when she woke her temp was 40 degrees …..Her breathing and heart rate were very high and she looked visibly unwell..
She has been recommenced on the very broad spectrum antibiotic she was on a few weeks ago in case she has meningitis again and this will cover her for many bacterial infections. The staff were initially preparing for a lumbar puncture on the ward before starting the antibiotics but the consultant decided against it and isn’t happy unless Orla is under a general anaesthetic as it might not be straight forward, although it was last time, because of her scoliosis. However there was no chance of getting a spot in theatre tonight and it is a public holiday tomorrow…..fingers crossed it won’t come to that. Orla was given paracetamol at 4:30pm and her temp hardly budged. She was then given some neurofen which they don’t usually allow the BMT kids to have as it affects their platelets but as her blood counts are so good, they made an exception. This really helped and her temp was fine this evening before she went off to sleep, obviously masked by drugs but nontheless she was very settled and happy and thus we were much more relaxed. She appearred the most unwell today when she was given the first dose of antibiotic which can induce nausea and obviously did as she looked shocking and Ed and I asked for the consultant to be called back in who quickly pinpointed the issue, so we are in very good hands. The ENT doctor came to review her too as her right ear looked like it may be infected which its not however he did remove a decent piece of wax!! So next time, I am not writing until we get home….Fingers crossed this setback is not as serious as the last and doesn’t delay us for another month….It’s easy to see it is more difficult to get out of hospital than it sometimes is to get in! 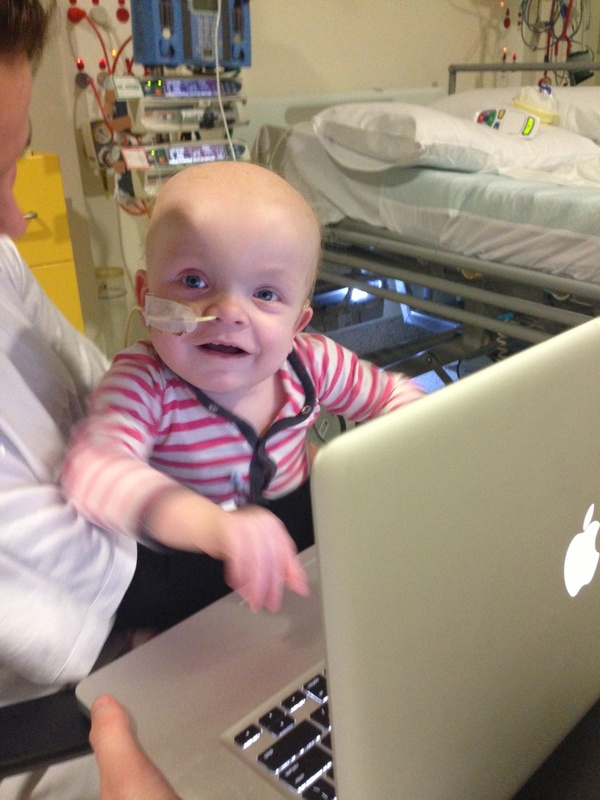 It is with mixed emotion and exhaustion that I type our last post from the bone marrow transplant unit at RCH (well I least I hope it is…think positive!!). I am very excited about the prospect of going home tomorrow and regaining some level of normality in our lives. There will be a transition phase. Life will be a little lonely in some ways once that normality resumes as home doesn’t have a number of people to chat to or help with at anytime of the day. In addition, as Orla’s immune system is still immature we are limited in where she can go and who she can interact with for the moment. The strongest emotion however for me tonight, is that of relief. Relief that “we made it” and are able to return home tomorrow as we arrived, a family of three. We even had photo’s taken the day before Orla’s admission to the BMT unit in case that wasn’t to be. I knew then and I know even better now, this is a reality for some families so for that we feel very lucky and eternally grateful. Orla is not out of the woods from a transplant perspective yet as acute graft v’s host disease can strike at any time in the first 100 days post transplant. Although anecdotally the risk seems to decrease slightly around the 2 months mark and as today is day + 60 we are doing well! Orla is currently on a number of medications and this will continue for up to 12 months for some. She is receiving all her nutrition via nasogastric feeds currently and in time she will need to resume eating so we can wean her from the feeds. Initially we will be attending outpatients twice a week to closely monitor her progress with the BMT team. The metabolic doctors will also see her regularly. She will also be easing back into physio and commencing early intervention therapy at home too. All of this, will keep us pretty busy along with the appointment roundabout of hearing tests etc. So leaving the BMT unit is really the end of a chapter and the beginning of a new. It is exactly 5 months today, that Orla was diagnosed with Alpha Mannosidosis and ,wow, so much has happened since. I really hope that one of my very good friends is right in saying that we have done the “hardest part”. Before I sign off tonight, I want to say thanks on behalf of Ed, Orla and I to every person that has helped us along our journey so far. The generosity of our friends and family is heartwarming. We will not be able to adequately express our appreciation for the endless amount of supportive calls, texts, messages on the blog, emails, meals prepared, meal rosters, presents and cards, more meals (the staff at the hospital have been amazed by the amount and quality!!) coffee’s, listening ears, shoulders to cry on, artwork for Orla’s wall and the list goes on …. As the saying goes and it’s true, you find out who your friends are at a time like this and we are very very lucky. Finally, I want to thank Orla and Ed for their strength and love, without them I wouldn’t be sitting here but wouldn’t have made it either. For home on Wednesday that is! And after 10 weeks, we are very ready!! Orla has remained well over the past few days so fingers crossed this continues. She had her final intravenous (IV) line disconnected on Friday so just has the nasogastric feeds are now attached and these can be disconnected for a bath, walk etc. She has been tasting a few foods over the past few days too which is a great sign too. Her Hickmans line will stay in for at least another few months. We will need to come into RCH twice a week for blood checks and appointments with one of the BMT consultants and possibly blood transfusions etc. Having the HIckman line insitu means any IV access required is pain free for Orla however the line does pose a risk of infection. She will have it dressed once a week as part of our appointments. All of Orla’s medications are now being pushed down her nasogastric tube except for the cyclosporin which she has orally as it unfortunately sticks to the tube. Ed had his first go at administering some of Orla’s medication on Sunday and sprayed it across the room as he tried to push it in with the clamp on!! Day + 56 And the good news continues…..
Today we received the news that Orla’s Alpha Mannosidase (the enzyme she is lacking) is now within normal limits in her blood…..see it here with your own eyes!!! There was no reason to think that it wouldn’t have normalised since her engraftment is excellent however to see it in black and white is truly amazing. Ed responded to this news with excitement while I simply cried with utter relief and Orla looked on perplexed at me crying! We still don’t know exactly what the future will hold for Orla, time will tell that. The effects of the Alpha-Mann cannot necessarily be reversed but what it should mean is no more progression. What we do know is that we have done everything possible to give her the best chance in life and ultimately that is all any parent can do. Day + 55 Good news day! We now have the results of what’s known as Orla’s fluorescence in situ hybridization result more commonly or easily referred to as FISH. Essentially this is a close look at her blood cells to see how many are from the donor, which are male, and how many are her original ones and thus female and the result is 97% donor. This is fabulous news as anything over 95% is viewed as an excellent engraftment so essentially the transplant at this point has been very successful. As you can imagine we are delighted. We were hoping for a good result as Orla’s blood counts have continued to be good, other complications have been keeping us in hospital. The other good news is that we are planning to go home next Wednesday. The IV nutrition has been turned off today and Orla’s feeds are now up to 31mls per hour which she is tolerating well. Her Hickman line has two lumens to access intravenously and one of these has now been locked off too so the number of pumps, syringe drivers etc Orla is attached too is now down to just 2! Ed and I went to a parent’s dinner here at the hospital last night. Challenge, who are a wonderful charity for the families of children living with or receiving cancer treatment organise a chef to cook dinner for the parents once a month. It was great to meet some of the other parents of children in the BMT unit and cancer ward and share our stories. Day + 53 Never dull…. It’s hard to believe as I type the title for this post that we are at Day +51 and still in hospital……!! Orla is progressing pretty well. Tonight she will have her final dose of IV antibiotics so fingers crossed she remains temperature free. We are going very slowly with the rate of increasing her nasogastric feeds, going up by just 1ml every 12 hours. She will be at 20mls per hour at 6am tomorrow and she needs to get to 38mls. She currently receives the remaining nutrition she needs intravenously (TPN) and every time her nasogastric feeds go up, the TPN titrates down. The team plan to switch her back to oral cyclosporin, the immunosuppression medication, early this week in anticipation of home and now that her gut and bowel are recovering she should absorb it efficiently. She has been requiring anti hypertensive medication most days of late, high blood pressure being a common side effect of the cyclosporin. So it is quite likely she will need something ongoing to manage this. The dentist had to come back to see her again last week as she has been bleeding from her mouth. This is due to her molars erupting and being sharp and thus piercing the opposite gum. The Alpha Mannosidosis has caused issues with her teeth and in Orla’s case has meant less enamel and thus sharpened her teeth. She doesn’t actually have enough teeth through to be able to file and smooth them and if she were to have this done she would need a general anaesthetic so we will leave it for the moment. However this will create an additional challenge for eating which she currently has absolutely no interest in….. we are basically going to need to start at the very beginning…a very good place to start! The doctors are taking things very cautiously re home as they were quite blown away by what happened when we were nearly there last time! Orla looks well in herself and everyone is commenting on this and we hope home will be a reality within the next week or so…. Day + 48 Songs make me smile!